#suffolkfolkphoto - #3 I've met the The Fairy Dogmother and she's lovely. Welcome to my series of photo-stories entitled #suffolkfolkphoto. This is where I get the opportunity to get to know and photograph a variety of the counties more colourful, go-getting, influential and interesting characters associated with the beautiful county of Suffolk. I love our little Dog, a French poodle named Corbie; he's definitely become part of our tight family group(he's the little white dog in Tracy's arms-Pix 2 & 3). When it comes to family holidays aboard it's always a wrench having to leave him behind; luckily we have a great friend who loves Corbie just as much as we do and will look after him at the drop of a hat. Many of us lead busy lives; there seems to be so much more demand on our time, for a host of different reasons. I know I feel incredibly guilty when our dog has to be left at home for too long. But luckily we love walking Corbie both locally and further afield so he gets a good and regular walk. But I know there are times when we could all do with a professional dog walker in our lives, just to give a helping hand on the odd occasions. Well, Step forward Tracy Root, Suffolk's very own Fairy Godmother. Tracy regularly passes my home on her way to Christchurch Park. The one thing I've noticed is that however many dogs she might have on her leads, she's always in control over them all, a control, most of us dog owners wished we all had. Whether there's six or just two dogs with her, she seems to have that perfect mastery with man's best friend. Tracy started her business just three years ago now, and with her partner, Richard, also known as the Dogfather, have overseen its successful transition from walking dogs to offering daycare, holiday stays alongside house sitting, she'll even feed the odd cat from time to time. Tracy loves everything about her job, 'it's like winning the lottery for me, I'm free to do what I love every day of the year'. She adds 'whether it's rain or sunshine, it's all the same for me, there's no such thing as a bad weather day for me, you just need to wear the right clothing'. 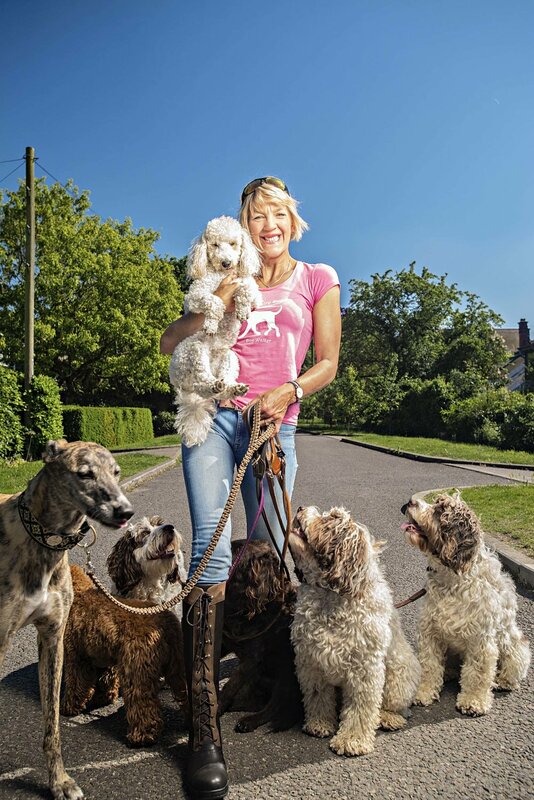 Tracy's happy disposition certainly gets her noticed; I always see her chatting with many of the other dog owners in my local park, well they do say that word of mouth marketing is the best way to promote one's business, and she certainly has people talking about her business. And with her little-liveried car, custom built to accommodate up to 5 dogs, you can't fail to notice Tracy driving through the streets of Ipswich. Tracy has had a variety of jobs in her past, but she's now finally found her calling, 'Dogs keep me fit and love unconditionally, they're lovely companions, giving us so much, both mentally and physically'. Good luck to the Fairy Dogmother and I hope to see her walking with her clients dogs for many years to come.